Oittm is a brand you might not have been too familiar with before, but it’s a name you won’t soon forget once you see how great its new multi-device charging docks are. 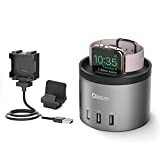 The new Oittm 5 in 1 Charging Stand for Apple Watch an iPhone has a spot for your magnetic Apple Watch disc charger and another spot for your iPhone, allowing you to charge both devices at once. On top of that, it also has three more USB ports on the back to charge three additional devices. If you’re looking for something more compact, the Oittm 4 in 1 Charging Stand has space for one device on top, either your iPhone or Apple Watch. Then there are still three USB ports on the back for more devices. Both devices are on sale today at their best prices ever. The 5 in 1 stand is $19.79 with coupon code IXJV6Q52, and the 4 in 1 model is only $17.39 when you use the coupon code 2IY2QQNR at checkout. [Charge with Confidence]: The iPhone charging cable and apple watch magnetic cable is not included. Limiting current for each port and the wide woltage, which can smart detect to prevent your devices against over-current, overheating and short circuit, no longer worry about damaging your iWatch/iPhone/iPad etc. [High Quality Material]: Made of high quality refined crafted Aluminum, silicone,ABS Plastic. Light Weight, Sturdy and Fashion. Super convenient and perfect for daily use. To avoid the scratch of your phone, pls carefully and slightly when you install the aluminum bracket of back and place the phone. [Cable Management Design]: Built-in cord organizing space can help you manage your long cable, make your desk neat and less clutter. The cable must be placed neatly, or you can’t close the lid. Pls follow the installation instructions and pics of “Enhance Brand Content” page to install this stand. [5 Devices Charging Simultaneously]: 3-port USB in the back allows you to charge your iPhone & Apple Watch along with any three Additional Devices simultaneously. This stand offers you more convenience of charging your devices in one place. [Lifetime Warranty and Use safety]: AC adapter(UL certification has passed) includedThe cable must be placed neatly, or you can’t close the lid. Whe you remove your phone after charged full, pls kindly hold the silicone part with your one hand, other hand hold your phone to leave. [The Oittm Advantage] 3 in 1 replaceable bracket for apple watch, iphone and fitbit blaze, fully considered user’s needs. 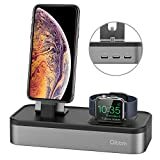 [4 Ports Mutilfutional Rechargeable Stand] One inside USB port for the Apple Watch and three outside USB ports for other devices, supporting charging of all Apple Watch models & three USB 2.0 and 3.0 devices simultaneously (iPhone Xs/Xr/X/8/8 Plus, iPad Pro, Samsung S7/Edge included).